To reach a Teller or Member Service at any of our locations, contact us at info@newdimensionsfcu.com. For your convenience, we have outlined the holidays our branches will be closed! Please visit the following link for a complete list of holiday closings. We have added a holiday window cling to our doors and drive-thru windows that lists all observed holidays that state when we will be closed! This will enable you to see the full year in a snapshot in order to plan your visits into the credit union. We have four convenient offices to serve our members. If you have any questions about our products and services, our contact information has been provided for you above. For your security, do not include sensitive information in your email, such as your social security number. Please use our secure message system through Online Anytime for more detailed inquiries. 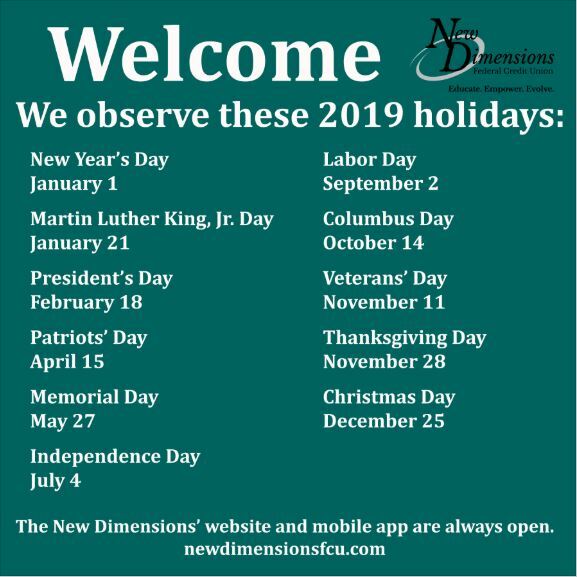 Thank you for contacting New Dimensions FCU – any information entered here is generic in nature such as First and Last Name, email address, and any questions, comments, or complaints that you may have. Please DO NOT SUBMIT private information such as your social security number or account number through this channel – any requests sensitive in nature can be addressed by dialing (207) 872-2771 or (800) 326-6190 to speak with a Member Service Representative. Once your email has been received, the appropriate staff person will respond within 24 hours or the next available business day.